The Zebra ET50/ET55 tablets combine the chic appearance of a consumer device with the necessary reliability of an enterprise tablet, and bridge the gap between the short-lived end consumer segment and the highly durable tablet area in the high price segment. 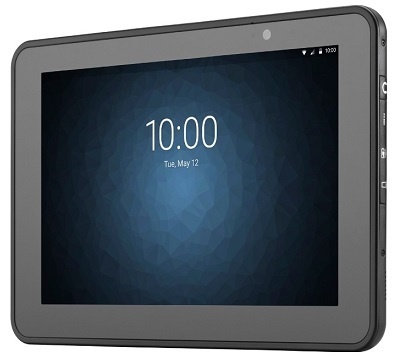 With either a 10.1 or 8.3 screen size, plus Windows 10 or Android Lollipop and numerous expansion options, the elegant enterprise tablets cover a large working environment - perfect for use in the fields of transportation and logistics, field service and in retail stores. For native wireless communication the ET50 offers full wireless support 802.11a/b/g/n/k/r, NFC and Bluetooth 4.0. The integrated Quad Core processor with 2.4 GHz and 4 GB of DDR3 RAM thereby processes large amounts of data at a high speed. For use in the field the ET55 offers full WWAN connectivity with a high data rate in the LTE standard. With the versatile accessories like the charging station, screen protector or the extra-robust frame, they expand not only the tablet itself, but also the application areas of the ET50/ET55. One Enterprise Tablet, many applications and accessories. The Zebra ET50 — consumer styling on the outside, all business on the inside. Zebra ET50 marries the best of consumer-styling with all the enterprise-class features you need to increase workforce productivity, with a real business class return on your tablet investment. Your workers get the elegant personal tablet styling they want, while you get a durable tablet designed to last for years, exceptional battery power, enterprise-class first-time every time rapid capture of practically any type of business data, plus a comprehensive family of business accessories to easily customize a solution for just about any job. Zebra Service, ET5x - 3 Year Zebra OneCare Essential. Includes Comprehensive Coverage.